Tear fresh basil leaves and sprinkle liberally over the slices. Add salt and freshly ground pepper to taste. Just before serving, drizzle on some top quality extra virgin olive oil. 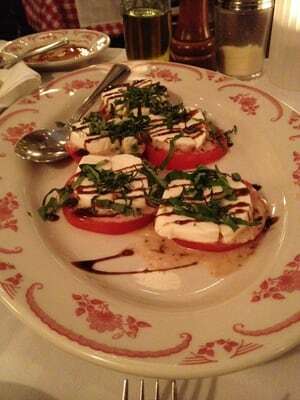 Maggiano's also adds a little bit of balsamic glaze.